On a touch-enabled device, draw with your finger, a digital pen, or a mouse. Available inking features depend on the type of device you're using and whether you're an Office 365 subscriber. If your device is touch-enabled, the Draw tab is turned on automatically. Otherwise, turn it on by selecting File > Options > Customize Ribbon > Draw. The new pen set is customizable and portable. You define the pens you want to have, and they are then available in Word, Excel, and PowerPoint. On the Draw tab of the Ribbon, tap a pen to select it. In Word, you must be in Print layout to draw with ink. If the Draw tab is grayed out so that you can't select a pen, go the View tab and select Print Layout. Tap again to open the menu of Thickness and Color options for the pen. Select your preferred size and color. There are five pen thickness settings ranging from .25 mm to 3.5 mm. Select a thickness or use the plus or minus sign to make your pen thicker or thinner. 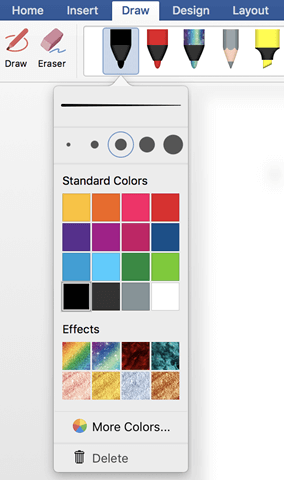 Sixteen solid colors are available on the menu, with more available when you tap More Colors. Eight effects are also available: Rainbow, Galaxy, Lava, Ocean, Rose Gold, Gold, Silver, and Bronze. When you draw with the Pencil texture while using a supported digital stylus, you can tilt the stylus to get a "shading" effect, just like you would get with a real pencil. On the touch screen, begin writing or drawing. Once you have drawn an ink shape, it behaves like any shape that you are used to working with in Office. You can select the shape, then you can move or copy it, change its color, pivot its position, and so on. To stop inking and select your annotations, either to modify or move them, pick Select on the Draw tab. 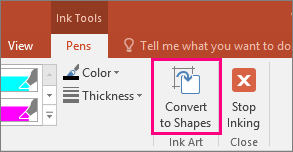 See Convert ink to text or shapes in PowerPoint for Office 365. Under Draw > Tools, tap the Eraser. With your pen or finger, drag the eraser over the ink you want to remove. 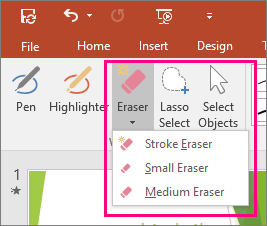 With the Segment Eraser in PowerPoint, you can simply tap a segment of ink or drag across it to remove it (rather than having to thoroughly wipe away the entire segment). Dragging across segments is an easy way to erase several at once. Some active pens, such as the Surface pen, have an eraser that you can also use to erase digital ink. All apps include a standard selection tool on the Draw tab of the Ribbon that can select both digital ink drawings and any other kinds objects. PowerPoint and Excel also have an ink selection tool, Lasso Select, specifically for selecting objects drawn with ink. It's most useful when you have a mixture of standard and ink objects and you only want to select an ink object. Under Draw > Tools on the Ribbon, tap Lasso Select . With your pen or finger, drag to draw a circle around the part of the drawing or word that you want to select. A faded, dashed selection region appears around it, and when you're done, the portion you lassoed is selected. Then you can manipulate that object as you wish: move it, change its color, and so on. In both Excel and PowerPoint, with a digital pen, you can select an area without even tapping the selection tool on the ribbon. 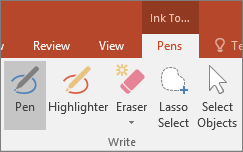 Use the supported digital pen button to Lasso Select ink without visiting the ribbon. Then you can use the pen to move, resize, or rotate the ink object. On the File menu, select Options, and then select Advanced. In the Pen section, select the box next to Use pen to select and interact with content by default. 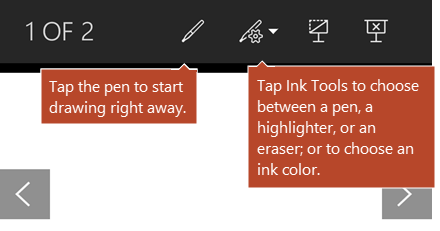 This setting only applies to the app in which you make it, so, for example, you can have automatic inking turned on in Visio and turned off in Word. 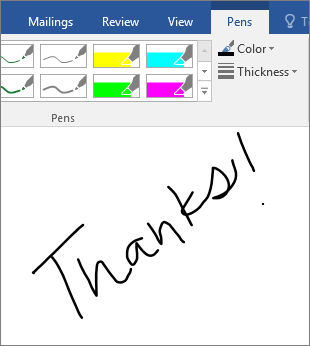 Go to the Review tab and select Start Inking to display the Ink Tools and Pens tab. Under Ink Tools >Pens choose Pen. To change the ink color and stroke width, point to the color and width (0.35mm - 0.5mm) you want. Under Ink Tools, on the Pens tab, click Highlighter, and then pick a highlight color. Point and drag your pen or finger over the text that you want to highlight. You can highlight text in Excel, Word, and Outlook, but PowerPoint doesn't support highlighting text. 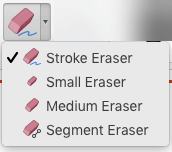 Under Ink Tools, on the Pens tab, click the arrow below Eraser, and then pick an eraser size. With your pen or finger, select the word or ink drawing that you want to erase. 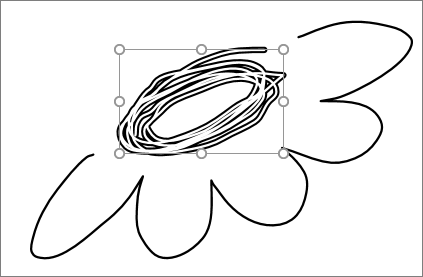 To select part of a drawing or some written words, use the Lasso tool. (You cannot use the Lasso tool to select non-ink objects (shapes, pictures, etc.). Under Ink Tools, on the Pens tab, click Lasso Select. With your pen or finger, drag to draw a circle around the part of the drawing or word that you want to select. A faded, dashed selection region appears around it, and when you're done, the portion you lassoed will be selected. With your pen or finger, select parts of the ink drawing or text that you want to erase. You can convert ink drawings on a touch screen into common shapes. Under Ink Tools > Pens, select Convert to Shapes. With a pen or your finger, draw a shape on the slide, and PowerPoint automatically converts your drawing to the shape that looks most like it. To stop converting shapes, click Convert to Shapes again. Which shapes can PowerPoint convert? When you create an ink drawing, PowerPoint can convert it to the shape that is most like it. Closed freeform with three sides. On the Mac, these features are only available in Office 365 and Office 2019 for Mac. There are five pen thickness settings ranging from .25 mm to 3.5 mm. Select a thickness to make your pen thicker or thinner. To stop inking and select your annotations, either to modify or move them, undo the selection of the Draw button on the Draw tab. Rather than drawing ink with your mouse, you can draw on a trackpad with your finger. See Use your trackpad for "touch" drawing for more information. With your mouse, pen, or finger, drag the eraser over the ink you want to remove. With your mouse, pen, or finger, drag to draw a circle around the part of the drawing or word that you want to select. A faded, dashed selection region appears around it, and when you're done, the portion you lassoed is selected. Then you can manipulate that object as you wish: move it, change its color, and so on. On the PowerPoint, Word, or Excel menu, select Preferences > Authoring and Proofing Tools > General. In the Pen section, clear the box next to Use pen to select and interact with content by default. This setting only applies to the current app. So, for example, you can have automatic inking turned on in Excel and turned off in Word. If you're working in OneNote on your iPad, see Handwrite, draw, and sketch. By default, Draw with Mouse or Touch (or "Inking mode") is turned on when you are using a mobile device. Just tap the Draw tab, select a pen , and you can begin drawing ink on a slide. (For Office 365 subscribers only) Eight effects are also available: Rainbow, Galaxy, Lava, Ocean, Rose Gold, Gold, Silver, and Bronze. The Apple Pencil is sensitive to pressure, which allows you to vary line thickness. It's also sensitive to tilt, which allows you to create shading, as you can with a tilted lead pencil. To stop inking and select your annotations, either to modify or move them, turn off Draw with Touch on the Draw tab. Turning off this feature also keeps you from making accidental ink marks when your hand touches the screen. 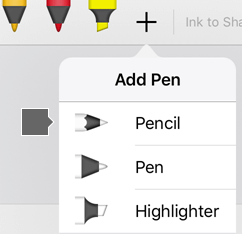 On an iOS device, Inking mode is turned on when you have selected a pen or highlighter on the Draw tab. Otherwise, you are in Select mode, and you can tap to select an object. PowerPoint and Excel have an ink selection tool, Lasso Select, specifically for selecting objects drawn with ink. It's most useful when you have a mixture of standard and ink objects on a slide and you only want to select an ink object. On the Draw tab on the Ribbon, tap Lasso Select . With your pen or finger, drag to encircle the ink that you want to select. A faded, dashed selection region appears as you drag, and when you're done, the portion you've lassoed is selected. Then you can manipulate that object as you wish: move it, copy it, delete it, and so on. On the Draw tab, tap the Eraser. With the Segment Eraser, you can simply tap a segment of ink or drag across it to remove it (rather than having to thoroughly wipe away the entire segment). Dragging across segments is an easy way to erase several at once. Drag the eraser over the ink you want to remove. Office for iOS supports the 2nd-generation Apple Pencil and its double-tap gesture. By default, the double-tap gesture switches from the current tool to the eraser, but the System settings on your device allow you to choose a different behavior for this gesture. This feature is avialable to Office Insiders in Word, Excel, and PowerPoint on iPad version 2.22.19012801 and later. Open the Settings app from the home screen of your iOS device. Scroll through the list of apps at the bottom of the Settings page to find your Office app, and tap to open its Settings. 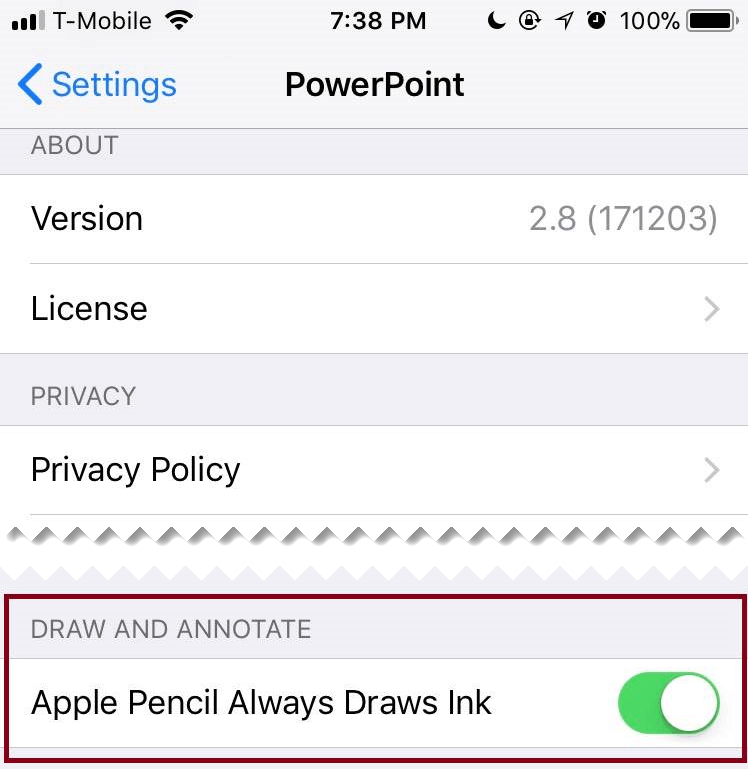 In the app settings on the right side, at the bottom under Draw and Annotate, toggle Apple Pencil Always Draws Ink. Ensure that Draw with Mouse or Touch is turned on. With a pen or your finger, draw a shape on the slide. When you finish drawing, PowerPoint automatically converts your drawing to the shape that looks most like it. To stop converting shapes, tap Ink to Shapes again. On an Android device, Inking mode is turned on when you have selected a pen or highlighter on the Draw tab. Otherwise, you are in Select mode, and you can tap to select an object. PowerPoint and Excel have an ink selection tool, Lasso Select, specifically for selecting ink drawings. It's most useful when you have a mixture of standard and ink objects and you only want to select an ink object. To select part of a drawing or words written in ink in PowerPoint or Excel, use the Lasso Select tool. Some active pens, such as the Surface pen, have an eraser that you can also use to erase digital ink without having to select an eraser from the Ribbon. If you're working in OneNote for Windows 10, see Write notes and draw in OneNote for Windows 10. By default, Draw with Touch (or "Inking mode") is turned on when you are using a mobile device. Just tap the Draw tab, select a pen , and you can begin drawing ink on a slide. The Draw tab in Word Mobile, Excel Mobile, and PowerPoint Mobile for Windows 10 is similar to the desktop versions of each app. Before you can use the drawing features, be sure to update to the latest version of Windows 10. To do this, select the Windows button in the lower-left corner of your screen, and select Settings > Update & security > Windows Update. Click Check for updates to get the latest updates. Inking mode is turned on when you have selected a pen or highlighter on the Draw tab. Otherwise, you are in Select mode, and you can tap to select an object. 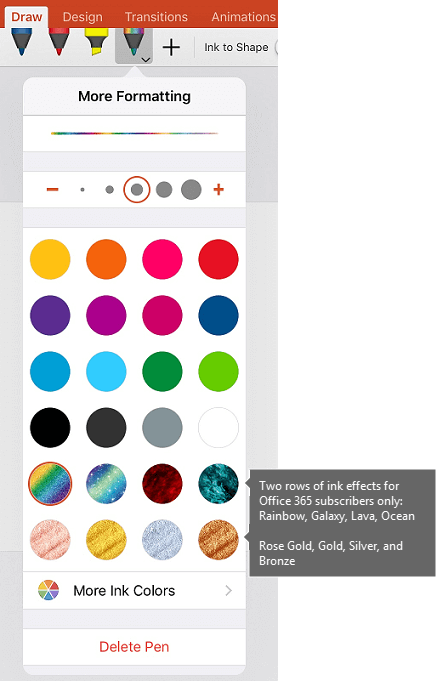 PowerPoint Mobile and Excel Mobile also have an ink selection tool, Lasso Select, , specifically for selecting objects drawn with ink. It's most useful when you have a mixture of standard and ink objects and you only want to select an ink object. 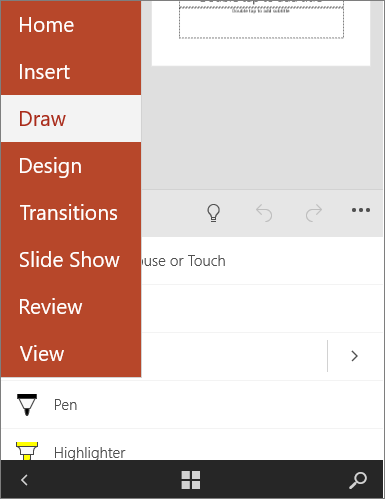 Here's how to see the Draw tab in Word, Excel, and PowerPoint on Windows 10 Mobile phones. Select the More button in the lower-right corner of the screen.